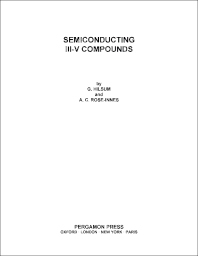 Semiconducting III-V Compounds deals with the properties of III-V compounds as a family of semiconducting crystals and relates these compounds to the monatomic semiconductors silicon and germanium. Emphasis is placed on physical processes that are peculiar to III-V compounds, particularly those that combine boron, aluminum, gallium, and indium with phosphorus, arsenic, and antimony (for example, indium antimonide, indium arsenide, gallium antimonide, and gallium arsenide). Comprised of eight chapters, this book begins with an assessment of the crystal structure and binding of III-V compounds, focusing on the properties of the zinc-blende structure as well as processes ranging from ionicity and infrared lattice absorption to electronegativity. The reader is then introduced to the band structure of III-V compounds and its theoretical aspects, along with cyclotron resonance and the diamagnetic Landau effect. Subsequent chapters discuss impurities and defects; optical and electrical properties; photoelectric effects; and preparation and applications of III-V compounds.